Sermon preached on Romans 5:1-11 by Rev. 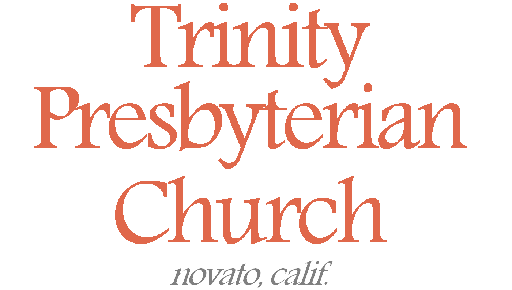 W. Reid Hankins during the Morning Service at Trinity Presbyterian Church (OPC) on 8/12/2012 in Novato, CA. As we continue our series in Romans, notice again the context and subject. Verse 1 has the word “therefore,” connecting us with the previous passage. Therefore, “having been justified by faith.” And so he’s still talking about justification by faith. And yet in this passage he turns to describe something that flows out of that justification. It’s our reconciliation. We’ve been reconciled to God. That’s clearly the focus of these eleven verses. And so today that’s the specific topic we’ll be talking about. We’ll talk about reconciliation. And this is a helpful concept for us as we think about how wonderful it is to be a Christian. The idea of reconciliation is such a colorful concept. Think about in your human relationships. When you get into some kind of conflict with someone, you know how awful it can feel. You can feel so alienated or estranged from that person. It’s especially difficult when that person is a close friend or family member, or maybe someone you look up to and admire. The tension and strain of the conflict can be stressing upon you. You might feel like you have to walk on egg shells around the person, or maybe they won’t talk to you anymore. However it works out, what is needed is reconciliation. You need to be reconciled to your friend or family member. Well, the Bible says that we needed reconciliation with God. That’s what this passage deals with. And if we can appreciate the difficulties caused by conflict with fellow humans, I hope we can appreciate today the issue at stake in our relationship with God. And so our first point today will be to consider the great need we have for reconciliation with God. Our second point will be to consider the glorious results that have come about since we as Christians have been reconciled to God. Third, we’ll consider how that reconciliation takes place in our life. So let’s begin then by seeing our great need. Realize that the underlying issue here is sin. Verse 8, for example, talks about us being sinners. The underlying problem is our sin. That’s why we need to be justified, and that by faith. Our justification deals with the guilt issue; it’s courtroom language; it’s forensic. But to talk about reconciliation is a little bit different. That’s relational. It’s about the fracture of the relationship. Don’t misunderstand me. Sin is still at the heart of why we need this reconciliation. But in justification God acts as judge to declare us in a right standing with his law. But in the reconciliation concept, God is not so much seen as the judge, but as the offended party. We haven’t just sinned. We’ve sinned against God. We’ve sinned against the Almighty. Our maker and sustainer. We’ve put ourselves at odds against the one to whom owe everything. And so our justification as well see, is related to all of this, in terms of the solution. But the specific concept of reconciliation helps us to better understand what all is going on in our salvation. Especially in relational terms with God. To put it another way, when we have human conflicts, there are at least two parties in the conflict. Two people at least in the conflict. In such conflicts, it basically involves sin against one another. One, or both parties, has sinned against the other. Reconciliation involves working through those sins, and looking to right wrongs you have done, in order to be reconciled with each other. Well, in terms of our relationship with God, we have sinned against him. He is the injured party. This issue of reconciliation with God isn’t something that goes both ways. Scripture says that we are reconciled to God, not the other way around. God isn’t reconciled to us, we are reconciled to him. We were in the wrong. In our salvation, we need to make things right with God and find his forgiveness. This is why Paul can use the language of needing peace in verse 1. It’s also the reason that in verse 10 he calls us formerly enemies. Before we were reconciled to God, we were enemies to God. That’s a pretty strong way to describe the situation, but that’s what we are talking about. When you wrong someone, and don’t reconcile, then you are their enemy. You are standing in opposition against the person that you wrong, instead of looking to remedy the situation. This is why we would need peace. We are not in peace without reconciliation. We are essentially at war with God at that point. That’s why it says in Ephesians 2:16 that prior to being reconciled, we are at enmity with God. We are in a state of hostility toward God. The sobering ramification of this enmity with God is God’s wrath. God as the offended party has a righteous indignation over what we’ve done against him. This is the wrath mentioned in verse 9. It’s the same wrath mentioned back in chapter 1, verse, 18. It’s the same wrath mentioned again in chapter 2, and chapter 3, and chapter 4. To put it simply, God is angry. Jonathan Edwards was right when he preached that it’s a terrible thing to be a sinner in the hands of an angry God. If we are wise, this should cause us to shudder. God’s wrath does result in fire and brimstone. God’s wrath will send people to hell. God is angry and the testimony of Scripture is that God is right to be angry. He made us and told us how to live. He demands our allegiance and worship. He calls us to love truth and hate every lie. But these are things we have not done. The Bible says that this has made humans enemies and under his wrath. The world today doesn’t want to hear this. They don’t want to acknowledge that they are God’s enemy. They don’t want to acknowledge an angry God. And so they invent their own reality. One where such a God does not exist. One where they are in the right. And yet that is not reality. I think of the first blessings in the beatitudes. Blessed are the poor in spirit, for theirs is the kingdom of heaven.” This is what this poor in spirit is all about. It’s about recognizing your dire estate. It’s about recognizing your sin and misery. It’s about seeing how that has cut you off from God. It’s about seeing the desperateness of your situation. This is our great need. To see how we must be reconciled to God. To understand our situation and how grave it is. So much of church today seems to not want to go here. They want feel good, consumer-friendly, church. I can understand that maybe some preachers have in the past only focused on the fire and brimstone. At the same time, God is not pictured in the Bible as just the happy go-lucky God just casually waiting and hoping that you might come to church this week or that you might pray to him. Scripture shows him as holy. And he would have you to treat him as holy. When we don’t, it shows our great need. To be reconciled to him. One last analogy on this point. We said that in our earthly conflicts with others, how we can feel so stressed out about it, or so “off.” We can be heartbroken or tense or have a sinking feeling in our stomach because we know we’ve screwed up in a relationship with someone, and we’ve hurt them. And that they are offended. We don’t know what will come of our relationship. I guess the point I’m making is that many people today haven’t come to that point with God. They’ve sinned against him. They have not been reconciled to him, but they don’t pause to consider it. They are either oblivious to it, don’t believe it, or just don’t care. But the Scriptures would have us to be awakened to this reality. We should be greatly concerned about it! So then, let’s turn now to our second point. To see the glorious result of our reconciliation. This is the pronouncement of our passage. Because of our justification by faith, we now have peace with God through our Lord Jesus Christ. Peace. That’s what Christians now have. Peace, not hostility. No longer at enmity with God. We were his enemies, but we are not anymore. That’s the point of verse 10, “when we were enemies,” means that we are not enemies anymore! We also see the result of this reconciliation with other general, but relevant, statements. Verse 10 talks very generally about being saved. Verse 9 talks about some of that salvation by telling us that we’ve been saved from God’s wrath. Instead we are told here that now we have hope, a glorious hope: verses 2, 4, and 5. And so all of this is painting a very opposite picture from before. Instead of being enemies under God’s wrath, we now have peace and are saved by his wrath and have the hope of glory. This is come about through being reconciled to God. Another implied result of all of this is that we now are given strength to live for God and according to God’s will for our life. Verse 6 talks about a time when we were without strength. In other words we were weak. That’s when we needed salvation. That’s when God worked to save us. But the implication then is that our former time was one of weakness. This passage doesn’t state why we were in weakness, but something relevant can be inferred. Verse 5 talks about the gift of the Holy Spirit. When we are at enmity with God, the Holy Spirit is not living inside us. When we are reconciled to God, we are brought near to him. His Spirit then is given to live inside. This is going to be for our strength. This seems to be a subtle connection here in the text, and certainly is a point we get from Scripture in general. We have strength in our reconciliation because God now dwells inside us. This is strength especially to live as God’s friends. As his blessed people. Another result of our reconciliation is that God’s love has been poured into our hearts. Verse 5 connects that closely with the gift of the Spirit, and in our hope. We’ll talk more about God’s love in a moment when we think about how it motivated our reconciliation in the first place. But here now realize that a benefit of reconciliation is that God’s love has been poured into your hearts. Surely this means that we both know God’s love and can now share it to others. But think about this in the reconciliation sense. When you are not reconciled to someone, you might wonder what they think about you. After becoming reconciled to them, you might still wonder if things are really better between you. But if they go out of their way to make their love known to you, then you know that things are going to be okay. Well, that’s what God has done. After he reconciles us to himself, he then pours his love into our hearts. He fills us up with it. He does this through the Spirit. God who is love enters our hearts by the Holy Spirit. His love is something that takes root in our soul. We deeply know it, and in turn can share it to others. A final outcome to mention of our reconciliation is the rejoicing that should now take place. Before we should have been afraid. We should have had fear of God’s wrath. No doubt many don’t realize this should be the case, and yet it is the reality. But this passage goes out of its way to show us that rejoicing is now what we should be doing. Those who are reconciled should rejoice. Verse 2 says we rejoice in hope of God’s glory. Verse 11 says we rejoice in God. This is the result of our restored relationship with God. I love how it describes this in terms of glory. It’s not rejoicing in glory as in heaven, though that’s certainly true. It’s rejoicing in the glory of God and in God himself. This is rejoicing in that relationship we now have with God. We rejoice in him. We find our boast in that we are his. This then is the opposite of those negative feelings we have in the middle of a conflict. We don’t feel the tension of a damaged relationship or an unresolved conflict. Having been reconciled, we rejoice in the glory of knowing God! God has and is lifting us up. That’s where our joy and boast is found. Let’s turn now to our third point. How do we come into this reconciliation? Well, first we can and should mention faith. Faith is again highlighted as the instrument for how we are reconciled. Verse 1 says it. Verse 2 says it. Though the instrument of faith is how we receive this reconciliation, we must ultimately recognize something more fundamental that makes our reconciliation possible. We have the mediator, Jesus Christ. And he has secured our reconciliation by what he did on the cross. Verses 1, 2, 9, 10, and 11, all point to this benefit we have through Christ, by his blood, and through his death. This is the of course where our justification is connected with all of this. Paul’s already made the point in Romans that justification is what makes us right before God. But this passage connects now his death not only with our justification but with how we are reconciled. But the two really go hand in hand. This is just like in our earthly relationships. When someone has wronged another person, true reconciliation is going to involve the offender to try to make things right with the offended. Now yes, the offended person should be quick to forgive. But nonetheless, we know that if you did the offending, you should try to make things right. Well, that’s what needed to happen in our relationship with God. Sin was the offense. But what could we do to make things right? What restitution could we offer? How could we fix our relationship with God? Well, we know we couldn’t on our own. That’s where our justification comes in. Our justification provides the foundation so that we could be reconciled. And of course that’s where Christ’s death comes in. His death is the grounds for our justification. And so it’s the foundation for our reconciliation. Christ as mediator reconciles us to God by offering himself to make things right. But you have to love how Paul explains this. How Paul explains the height of Christ’s sacrifice. Verses 6-8. Let’s read them again. “For when we were still without strength, in due time Christ died for the ungodly. For scarcely for a righteous man will one die; yet perhaps for a good man someone would even dare to die. But God demonstrates His own love toward us, in that while we were still sinners, Christ died for us.” Paul’s logic is easy to follow. It’s something we can appreciate. The idea here is that Christ sacrificed his life for us! Who would do that? Maybe, maybe someone might be willing to sacrifice their life for a righteous and good person. Maybe, but maybe not. It is their life. But would you do it for your enemy? For someone who’s repeatedly treated you badly? Would you? Yes, you might, maybe, for a good person, but for your enemy? Would you, really? It would seem hard to imagine a situation where we would. Except if we loved that person. Except if we loved them. Imagine if that enemy was your child. Your child who long ago had rejected you and spit in your face. But then the time came where they needed you. I could imagine sacrificing myself then for my child. Even for an obstinate rebellious child. But it would be only because of love. And yet that’s what this passage says it’s all about. His love. God’s love demonstrated for you. That Christ would die for you. When you were still an enemy. When you were unreconciled. When you were still at odds with him. And so now do you understand verse 10? Verse 10, “For if, when we were God’s enemies, we were reconciled to him through the death of his Son, how much more, having been reconciled, shall we be saved through his life!” If he did all this for us when were his enemies, how much more now? How much more now will God do in our lives as we live in the resurrected Christ from here on out? And so this is what we are to have faith in. Our faith brings us reconciliation, because our faith brings us to Christ. And it brings us to God’s grace. And his love. In this we stand. In this we are reconciled. In this we are saved. What a wonderful gift. And what a special relationship we now have with God. Praise the Lord. And if you’ve never experienced that reconciling love before, then today is the day. Put your faith in him, and you will not be disappointed. That’s even what verse 5 says! And so then let us indeed live with and for Christ. I love the contrast of verse 10 that I just mentioned. You see the contrast between Christ’s death and his life. It’s a contrast that’s connected with us. We are connected with both Christ’s death and his life. But it’s his life, his resurrection life, that now informs how we live. See, this living is the living we do now as the reconciled people of God. That’s why verse 10 says, “having been reconciled.” Having been reconciled, we live in a certain way. Having been reconciled, things are now different. We have a new life. It’s the same life of Christ. We are united in his death, and raised in his life. So then, let us live as such. Let us live Christ. There are so many ways to live out this new life in Christ. Given our topic for today, it seems one of those ways is in how we treat others. It’s in how we deal with conflict in our own life. This passage shows that God in Christ is about reconciliation. If we are to be conformed to the image of Christ, we too should be like him in how he seeks reconciliation. As Jesus said, blessed are the peacemakers. And so when you wrong someone in our relationship, seek their forgiveness, and look to right whatever wrong you’ve done. And yet that’s not saying enough. I think this especially has application for us when people sin against us. When people wrong us, and hurt us, and don’t care to be reconciled to us. We might want to wash our hands of them. We might want to just give up on their friendship. We might want to demand that if we are to forgive that person that they must make all the efforts. They have to find a way to earn your forgiveness, and then we’ll think about forgiving them. And yet surely this passage shows us a different spirit. This is a passage that would say that we should take the initiative in having them reconciled to us. We should be willing to suffer injury in order to bring back someone who has set themselves as your enemies. This passage would commend this attitude. Surely several other related teachings of Scripture would commend this. Like, for example, when Jesus calls us to love our enemies. Or how Paul challenges us in 1 Corinthians 6:7 to consider letting yourself get ripped off and wronged for the sake of gracious reconciliation. But oh how difficult that can be for us. We feel so wrong about letting someone do that. We feel like we are letting them get away with it. And yet the Scriptures tell us that love covers a multitude of sins. And so, live out the love you’ve been given. Christ paid the price that we could be made right with God. Will you not consider doing the same toward others? I know this is not easy. I know it’s a challenge. But it’s a challenge of grace. May we, as much as it depends on us, live at peace with all men. And as we do that, may Christ be glorified. And may his mercy be exalted. Praise be to God who reconciles us to himself, in Jesus Christ. Amen. Copyright (c) 2012 Rev. W. Reid Hankins, M.Div.